Looking for diamonds in Houston Texas? Look no further! We at Inter-Continental Jewelers help make purchasing diamonds in Houston easy to grasp and understand. Here’s the thing, diamond buying is not a common, everyday purchase, unless a special occasion has come up. Therefore, shopping for these extravagant jewels will require some education; and our experts are ready to help! Lets begin with the basics. Diamonds are available in varying colors, sizes and qualities. Naturally, they occur in colors ranging from very clear fine whites to pinks, bright yellows, greens and browns. 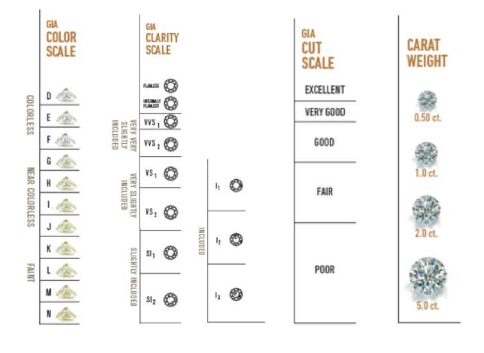 The majority used in jewelry stores in Houston today are white diamonds, and their value is determined by the Four Cs. Getting the best diamond at the best value comes down to knowing the rock talk, or what jewelers in the industry call the Four Cs: Carat, Color, Clarity and Cut. We’ll explain this more in detail when you come visit, but for now you may click here to learn more in detail. Each of the Four Cs are important and the most valuable diamonds are those that possess the best of all four characteristics. Understanding these Four Cs before you make a purchase will end up saving you money. Quick Tip: Do not confuse carat with karat. Carat refers to stone weight while karat refers to fineness of gold. A common spending benchmark for a diamond engagement ring is the equivalent of two-months salary. But we at Inter-Continental Jewelers advise you to be guided by your own financial situation to determine what you can afford. 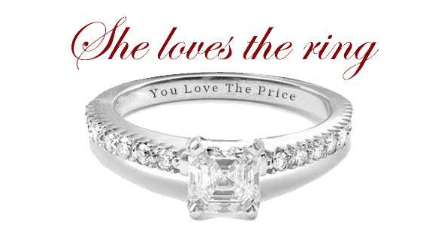 No other diamond jewelry store in Houston will take the time and talk to you about what’s best for YOUR budget. Over the years, this care and attention given to our adored customers has caught on and the word is out! Don't let someone convince you that you need a particular quality of diamond. Everybody has different needs and it is our commitment to find you the diamond that fits you best. When you call or come in, you will be speaking with a diamond expert who will have the stone in hand in order to see and describe it best. Speaking with us first about a particular diamond is in your best interest. After all, you are not buying a certificate, you are buying a diamond! Another element worth mentioning is the diamond’s shape. No single diamond shape is “better” than any other. Just pick the one you like best and we will take it from there! Every diamond shape is cut to bring out the most fire and brilliance. Facet shape varies with each cut, so they do filter light differently; and some shapes look better with certain settings. No matter what shape you choose, if your diamond is well cut, its sparkle and beauty will last a lifetime. And we guarantee are diamonds are cut to perfection! Many first time shoppers do feel overwhelmed and we’re here to say it does not have to be that way. Give us a call or come into our showroom and let us show you the difference between our store and every other Houston jewelry store out there. We ensure an excellent shopping experience. Let us prove to be your #1 diamond store in Houston that gives you the best bang for your buck, then sit back and watch all your efforts culminate as your diamond purchase lights up her eyes. Buy the Best Diamond Rings in Houston today!